I've been messing around with paper miniatures off and on for almost a year now, starting out when I decided to build some SF Western buildings using Inkscape while driving to my Parents' house (a long trip, and I was bored! ), ranging through a tongue-in-cheek set of rules for 10mm fantasy battles to the current stuff in question; figures and tiles for use with a modified version of Oversoul's Dice Chucker I am running with kids at the school I teach at during the rather damp lunch-times we have this time of year. Everything's been designed in Inkscape using a cartoony style, and makes use of built-in bases (converting to slot style bases would be fairly easy so if you want them, I can upload versions which work that way). The figures are 28mm scale, and the tiles use a 1 inch square grid - some of them have 3D features, but most are flat. The main idea is that each dungeon room tile comes with everythign you need for an encounter, so the Laundry comes with the fearsome Mrs. Krung, an Ogre Laundress, two Goblin laundry slaves, an escaped sock (with big pointy teeth!) an ironing table, a wash tub and a laundry basket, as well as a door. The dungeon tiles are pretty hefty file-size wise since they take up a whole A4 page, so I will not post them here. I'll just put up some preview images of the figures, and then let you follow the link to my Photobucket Account. First: i laughed a true lot at the "Porcotaur" name!!!! "Porco" is the italian equivalent of "pork", my town and my region is one of the most producer/consumer of pork meat, and reading it on a monster made me crazy! I'd use for sure a "Porcotauro" in my next D&D mastering. LOL! Second: you still don't know me, so let me explain that i'm a wannabe artist, so i am the one that don't draw anything but will critique any drawing the other members posts . You're not free from this curse, obviously! Third: your style is nice, and i see how it appeal kids. But you'll need to make the contours of the various body parts more "strong". To my shortsighted eyes they becomes color blobs very soon. Also, various thickness of the contour lines will help the figure to gain "depht", as your style don't use shading and shadowing to give the illusion of 3D. That's the only glitch i see on your figures, right now. Thanks a lot for sharing them. Good idea on the variation of line thickness to give the feel of depth, I'll have to try it out. Nice stuff. I like the figures a lot. They make some good sets. Welcome to the forum. I concur with Parduz about using line thickness to help your figures pop a bit more. I think having thicker lines in the right places can make a big difference. I think my favorites are definitely the orcs and porcotaurs. Very creative. Hopefully you will keep making new figs. I hope to see some more posts from you. Maybe if you want Nik could set you up with your own page to post your projects. It even looks like you've gotten a jump on the Cowboys Vs. Aliens phenomena. There are more figures and dungeon tiles to come. I have designed a set of 2.5D spiders which will go online soonish. I'm also planning to post the completed Battle Royale with Cheese 10mm figures some time soon. Since the figures are all designed for my school dice chucker campaign, I'll be producing more fairly often. I plan on doing some undead fairly soon, plus some large monsters; things like basilisks, cockatrixen (a long argument amongst my warhammer playing friends ended up with the decision that Cockatrixen is the plural of Cockatrice), and a sort of 3D giant slug/maggot thing, possibly with an undead rider. Soooo much fun! Can you share the adventure that goes with these "encounter pages"? There is no actual adventure, they are just generic Orc themed dungeon tiles. When we use them at school I have a deck of cards I have produced which list the rooms and their contents. I shuffle the cards and flip them over whenever anyone enters a room. So far we have not used all of the rooms just yet (there are a few which are yet to turn up; we've only had three game sessions, and they are only about 40 minutes each). 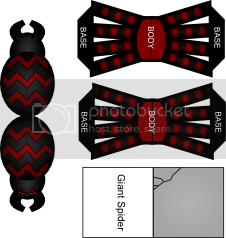 And here's a sample 2.5D giant spider. There's a whole set of six on my photobucket account. I'll assemble some tonight and post some photos hopefully. 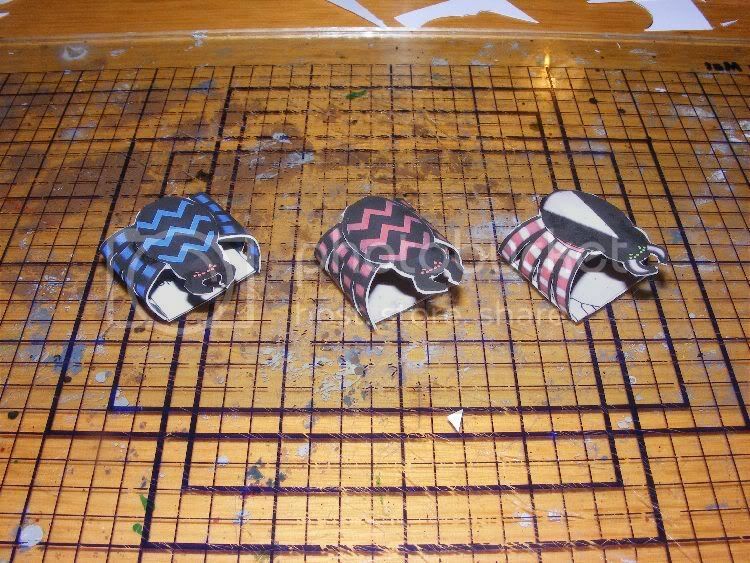 The idea is to fold the legs over, then glue them between the upper and lower body halves. The tabs on the ends of the legs go betwen the upper and lower base halves. Here are three completed spiders. All of my dungeon tiles and other figures are in my office at school, so you'll have to wait until Friday's club session for photos - I intend to take some in-use pics then. Here's an example using the barbarian. And photobucket is getting right up my nose - any time I move anything, I get the 'moved or deleted' thumbnail, even when I copy the NEW image location... and now it's giving me that bleeding thumbnail even for an image I've only just uploaded and not even moved! GAH! Much better. If i were you I'd go even more hard on the lines. As example, as the two arms and hands and the axe pole are the most "closer" to the viewer, i'd double the line thickness. It's a common "trick" in comics: things that are heavy and strong, or closer to the viewer are often drawn with thick lines to help the perceiving of the weight/depth.